This week has just been a doozy…..lots been happening behind the scenes here at Sugarlane….my head’s in a spin. 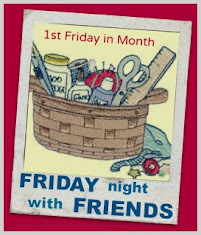 Thank goodness it’s FNSI….my Friday night starts now…..well, soon! If you haven’t signed up yet, HERE is the signup page….everyone is welcome and there’s a lovely surprise for one lucky FNSI’er. catching up on meetings forgotten (almost) and life in general, Friday has arrived so quickly. makes me sad I can’t make it, but I’ll be stitching my project with them from afar. Just knowing you can be close, even though you’re far apart, doing things you love ‘together’ makes me happier…..so with all life’s ups and downs…..
after all, it is FNSI and, despite everything it throws at you, life is beautiful! Hang in there - hope everything resolves itself. Wendy, I hope your "unforeseen circumstances" end up being positive and you get your stitchin' finished tonight!! Enjoy your Vit. F from afar.